I have done some research and haven't found any similar question. I have a VBA macro that imports a .CSV file containing telegrams sent by a device. In the end of this macro, I want to create a graph with the time elapsed on the x-axis and the value corresponding to the telegram. Boolean : "$00" or ""$01"
wsRes.Range("R1:R" & plotLine).NumberFormat = "$##"
Here is my final code for anyone's interested, adapted from Vityata's. This method will allow to easily add other datatypes if needed. 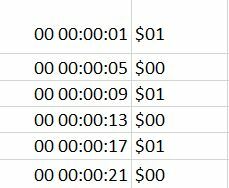 Case wsRes.Range("R" & i).Value Like "?? [ ]??" Case wsRes.Range("R" & i).Value Like "?##"